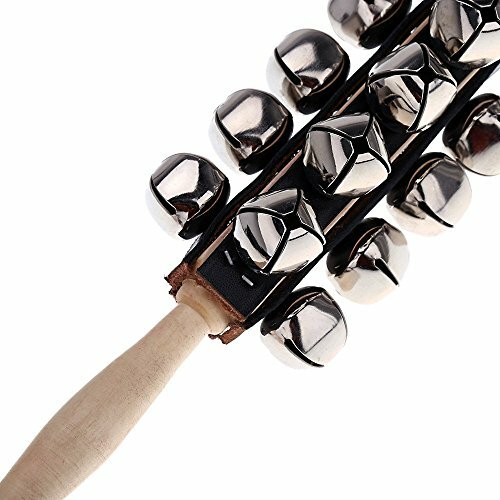 ndoer Sleigh Bells Stick Wooden Hand Held with 25 Metal Jingles Ball Percussion Musical Toy for KTV Party Kids Game by Andoer at Bass Brass. MPN: 3MQ1427683804689I5. Hurry! Limited time offer. Offer valid only while supplies last. This gadget with 25 metal jingles balls on top comes out with melodious plink. It can add much more fun to kids game, party, dancing, concert, etc. This gadget with 25 metal jingles balls on top comes out with melodious plink. It can add much more fun to kids game, party, dancing, concert, etc. 25 metal jingles balls are attached to leather strips and then mounted to a wooden handle. Comes out with melodious plink. A little bit big for kids to hold in hand but great for adults. Add much fun to party, dancing, concert, etc.